“We burn off a forest, an’ all we see is the cleared land, an’ the profit. We burn the forest because we say it’s ours to burn, an’ we can do what we want with what’s ours. We burn it, an’ the birds leave, an’ the grubs come, and the grain don’t grow so good. And there’s hot winds and dust. This may be the first volume of a trilogy; there may be a sequel to it – if, in the present book, I seem to have interested or amused sufficent readers to warrant such. Sure enough the two sequels to Heed the Thunder never came. Thompson’s literary greatness lay elsewhere, in another genre. I love Jim Thompson. He will be published in a new translation (in french) because the old ones are a lil’bit “old fashioned”. My two favorites from Jim are “Hallali” and “The criminal”. Nice to hear ‘Big Jim’s’ works are being reprinted. It must be difficult to accurately translate Thompson’s ear for dialects into another language. Fascinating stuff; really interesting . I didn’t realise that Thompson had GANS (Great American Novel Syndrome) but it doesn’t somehow surprise me. James Lee Burke had it (“Lay Down My Sword and Shield”) as did Jame Crumley (“One To Count Cadence”), but we shouldn’t hold it against them! Agreed. I can’t see any contemporary crime writers being the next Jonathan Franzen, but I think it’s better that way! Having done a pilgrimage to Dallas where Thompson worked in a Hotel, and lived in Los Angeles for a considerable time, It is easy to understand Why the great mans best friend was Whiskey. Easy too to see why he thought Crime writing was the only way out. And on that note of interminable darkness Crimezine would be honored to join your esteemed Blogroll please drop in you are welcome to subscribe too! Thanks for commenting. I’ve added you to our blogroll and subscribed to your site. 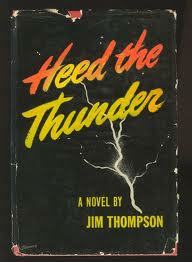 Interesting to hear you have made a Jim Thompson pilgrimage. I was in LA for a short time a few years ago and managed to retrace a few steps of James Ellroy’s early life.